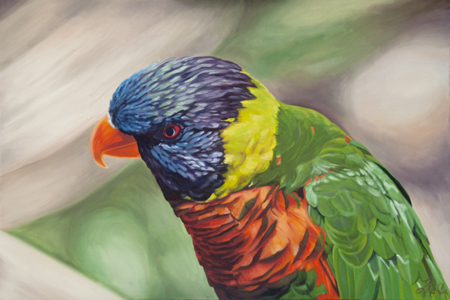 Always a fan of any bird, this amazing Rainbow Lorikeet has one of the brightest combination of colored feathers – turquoise, lavender, purple to black, orange, green to yellow. I met this particular bird in an aviary where you could feed him from a paper cup of nectar. The trick was fending off the flock that descended upon the visitors when it was feeding time. Serene and peacefully, the sun was raising beyond the low hills of Bonaire. Parent and child pairs of flamingos took flight at dawn from Slagbaai behind the plantation house. We had camped overnight in the Washington Slagbaai National park which gives an amazing opportunity to experience the daily life cycle in the salines. Less common than the similarly colored trupials, the yellow orioles (Icterus nigrogularis) can be differentiated by their yellow heads. Our little charmers are considered the sub-specie curasoensis restricted to the southern Caribbean Dutch islands. I have never seen one on the southern end of Bonaire where I now live. We occasionally got them in Hato, about mid-island, but these particular birds were seen during a camp out in the Washington Slagbaai National Park which takes up the northern third of our island. They perched on the patio walls, or hopped along the tiles looking for crumbs, I imagine. 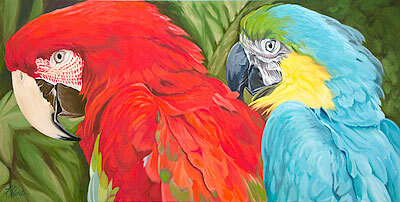 Two macaws sit close together on branch with their backs turned as if they had been conversing privately. Something drew their attention; they paused to look over their shoulders to see what it was. It is hard to believe the chatty parrots stopped for even a moment. 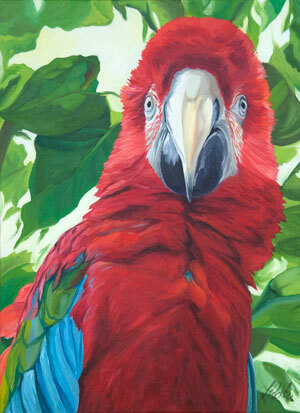 The red macaw is a Red-and-green Macaw, also known as the Green-winged Macaw (Ara chloropterus). The blue macaw is a Blue-and-yellow Macaw, also known as the Blue-and-gold Macaw (Ara ararauna). Deep in the heart of the mundi, a flash of blue and green sweeps regally by. Is that a peacock on Bonaire? Strutting about with the goats and cruising past the giant cactus on a Bonairean kunuku (ranch) are these birds which I have generally associated with tropical lush greenness. Unlike the stereotypical peacock pose, this guy has his tail feathers down and trailing behind – soft and flowing. 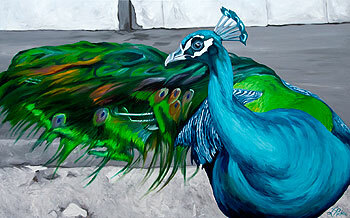 An almost monochromatic, simple background accentuates the long line of the tail feathers with the horizontal lines of the building, walkway and strip of rocky ground. This is a very tall, narrow panel like a window into the flamingo’s world. A single flamingo is ankle deep in the shallow tidal pools along the shore. The high noon sun has eliminated most of the shadows but that cast by the flamingo’s neck on its back. 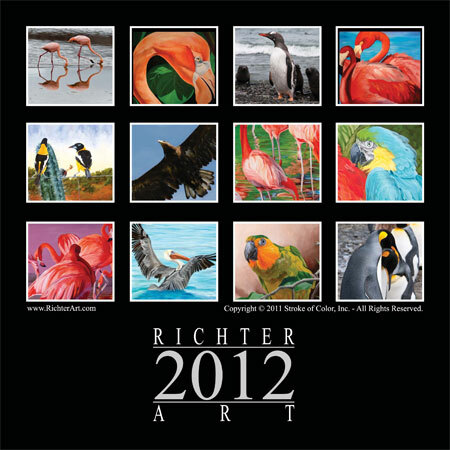 The flamingo’s bright plumage glows with color in the strong sunlight. 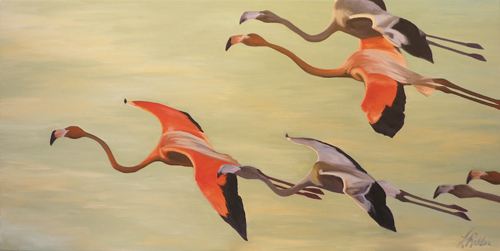 This painting depicts a flamingo at life size, up close and personal, but unafraid. The Keel-billed Toucan (Ramphastos sulfuratus, also known as Sulfur-breasted Toucan, or the Rainbow-billed Toucan) is a colorful Latin American Bird with a large bill. 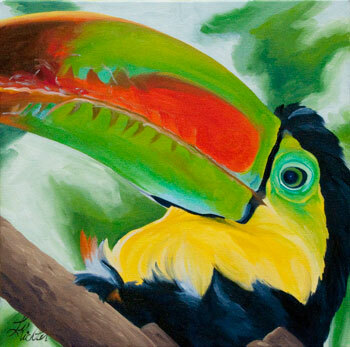 Bright, lively, and very colorful, this toucan evokes childhood memories – a bowl of colorful cereal and a fast talking cartoon bird. Chogogo is the local name for flamingo. 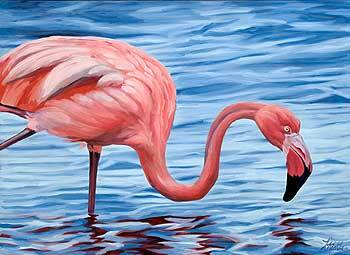 This flamingo searches the water’s surface in the dimming light of evening. The heat of the day is over and the turquoise waters have darkened.